Nearly six years ago (whoa, has it been that long?) I made koshary, a dish that involved lentils, rice and pretty much every single pot I had at my disposal. The meal was tasty, but it was a lot of work. 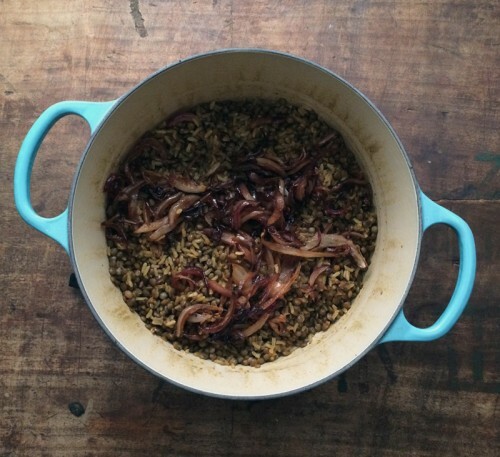 Koshary is pretty much just another name for mujadara – lentils, rice, caramelized onions, spices. It’s comforting and tasty and it’s a dish I always order it at the local Lebanese restaurant. Ordering it just seemed easier than making it. Well, that is until now. 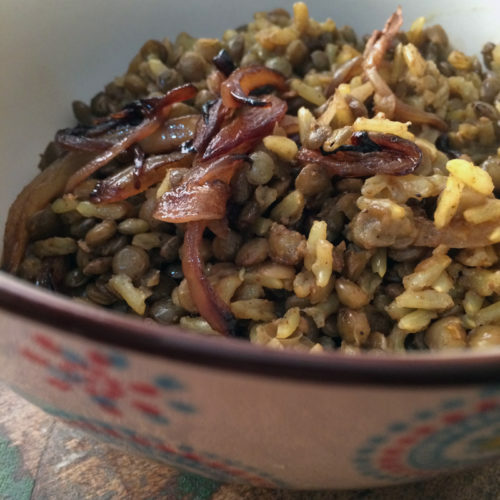 What’s great about this recipe is that the lentils, rice and spices all cook up together in one pot. No rice pot. No lentils pot. One pot. Well, I should add that there is a skillet too. But c’mon, one pot, one skillet. Not too shabby. On first glance, you might think this recipe has got a lot going on. It does have a few steps, but it’s mostly a cook it and forget about it kind of meal. First, you start off caramelizing the onion in a skillet. You stir it once in a while and you add in a little bit of balsamic vinegar which is my trick for getting the onions nice and dark quickly. Luckily, here the onions will get there on their own, but the balsamic bumps up the flavour a bit too. 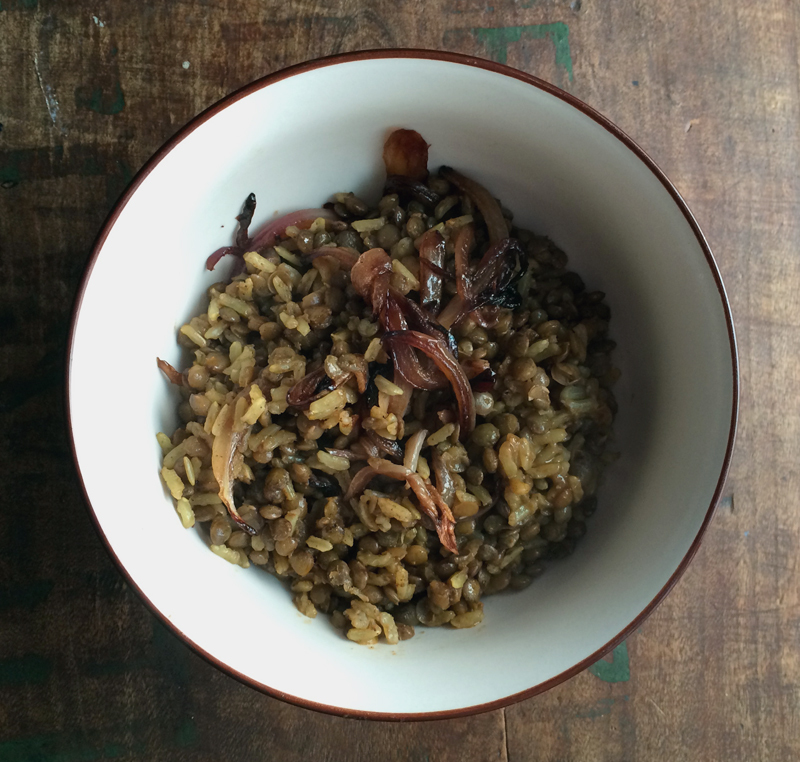 The onions get soft and a little crisp, a perfect condiment to the lentils and rice. You then prick the yams with a fork and pop them in the oven. I think this helps the potatoes to not explode. It’s something my mom told me to do, and so I poke my potatoes with a fork when I put them in the oven. Don’t let your potatoes explode! Sweet potatoes also drip sugar so I’d throw down a silpat mat on your cookie sheet to prevent a big mess. As your caramelized onions are caramelizing and your yams are baking away, the lentils and rice get sauteed in a heavy pot with oil, cumin, curry paste, bay leaves and cinnamon stick. It will be fragrant and by now you should have an idea of how things might taste. Add in stock, cover and simmer. See, not that tricky, right? The yams get mashed with coconut milk, salt and pepper. 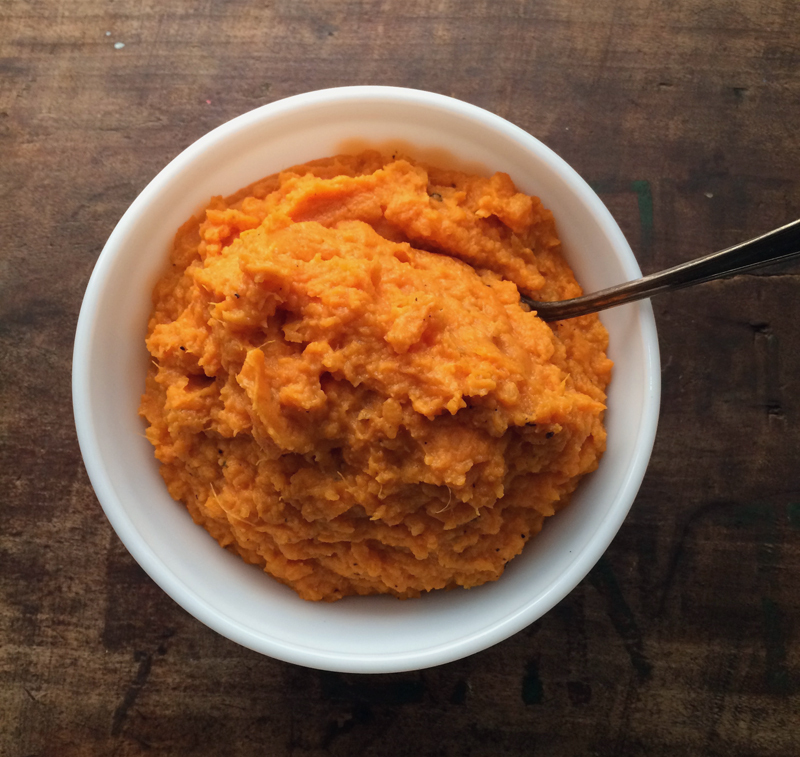 I first made these coconut mashed yams for our Thanksgiving meal and I’ve made them several times since then. They’re a great side dish, but I think they go especially nice with the curried lentils and rice. They add a nice sweetness to the meal and it kicks up the comfort level by a whole lot. It’s like a yin-yang kind of thing. Bright orange / brown. Smooth / lumpy. Spicy / sweet. It’s a contrast in textures and flavours and it all works so well together. I hope you give this a try, it’s something that will be made in this house quiet often this winter, as it makes quite a few leftovers and that’s always a good thing. The old koshary recipe included some greens and I think kale or spinach would be a good addition – just steam some on top of the lentil/rice mixture for a few minutes before serving. Or serve with some garlicky pan-fried kale. Or just eat as is. 1 can of coconut milk, full fat yo! 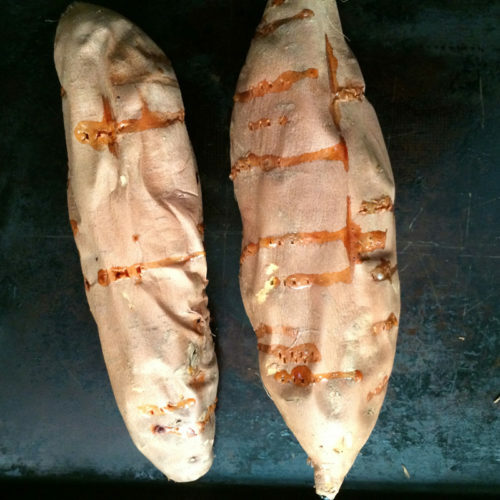 Place the whole yams on a cookie sheet and put in the oven to roast. In 30-40 minutes they should be tender. Remove from oven and let cool slightly. In a large skillet heat olive oil over medium-high heat and add in the onion slices. Stir around until glossy, add salt and let saute until starting to turn lightly golden, about 5 minutes. Turn down heat and cook for another 15 minutes. Add in balsamic vinegar and stir. Keep watch and stir occasionally until caramelized – 30 minutes if you want to cut some corners, 15-20 minutes longer if you want them a little crisp. Meanwhile, heat olive oil in a large heavy stock pot and add in the lentils and rice, along with spices. Stir so everything is coated in oil and a little toasted, just a few minutes. Add in 4 cups of stock, cover and bring to a boil. 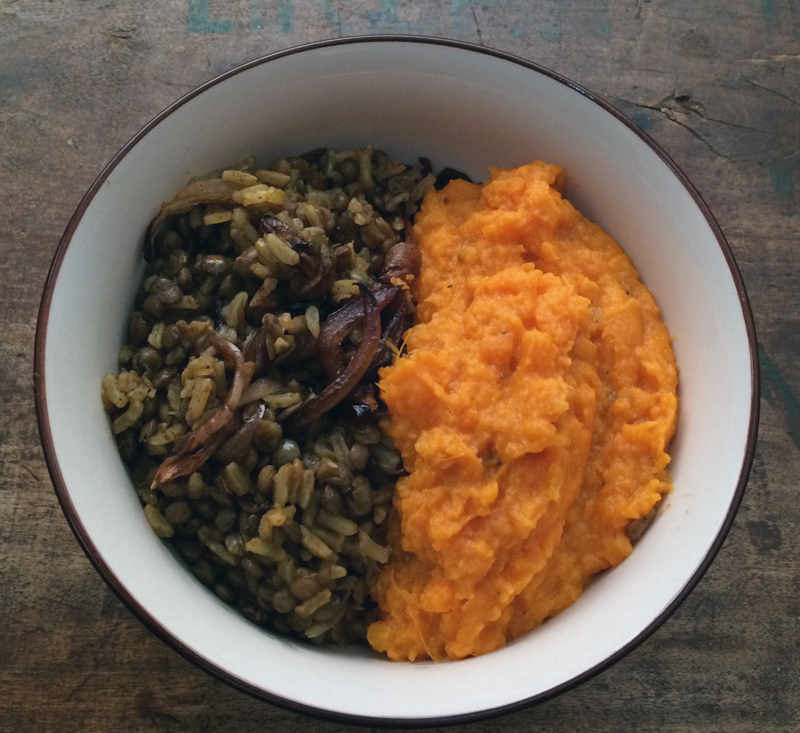 Turn down heat to a steady simmer and cook until the rice and lentils are tender – about 35-45 minutes. Check in to make sure the pot isn’t dry – if it is, add in a bit of water. Remove from heat and stir in the caramelized onions. Peel the yams (careful, they’re hot!) and add them into a large bowl. Mash with a can of coconut milk – I end up using nearly a whole can, but it will depend on the size of your yams. Add some kosher salt and freshly ground pepper to taste. 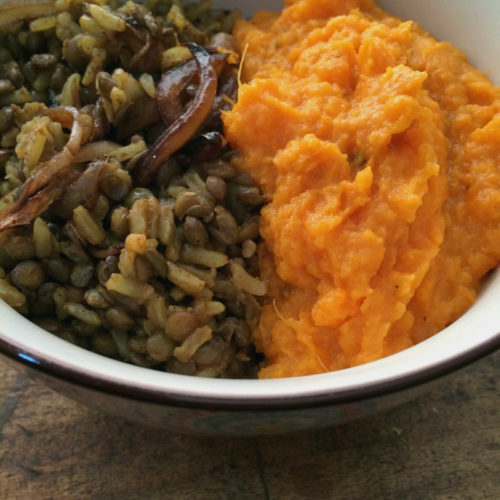 Serve in a bowl, half mudjadara and half mashed yams. Serves several large bowls. Looks great! Any flavoring substitute suggestions to those of us who have a preference to avoid curry and spice? Maybe paprika combined with… something else? This is a dinner I would really love… And then it would make great bring-to-work lunch leftovers, too! Pre, you can leave out the chili and curry and just use cumin – paprika would go well here. Maybe add in some fresh ginger too? It’s not very spicy and I think you could make it as spicy or as not as you’d like! Thanks Sues – the leftovers are great! Oh wow, does this ever look delicious! I’ve never made nor eaten mujadara before. I must change that. I love dishes that use only one or two pots! With 5 adult appetites in our family, and cooking with only a 2-burner hot plate and a toaster oven(also no dishwasher) in our tiny apartment in the top of my dad’s woodshop, the less cookware, the better. Vegetarianish makes this a definite to-try dish, as my oldest daughter has decided to eat that way. I have everything but the coconut milk. Sigh. Joanne, this is so good. I hope you can start eating lentils again. At least this way of making yams is soooooo delicious! Thanks, this was a knockout. What a great recipe, I hadn’t made this in a while but found it again by chance. Still as delicious as ever!